though the weather has been wonderful, thirty-something years’ worth of experience tell me that this current swiss summer weather likely won’t stay forever… something tells me it will soon make way for proper, spring-like unpredictability. that’s what i’ve grown to know (and love, kind of). [gap height=”20″]besides, all the indians eat daal all the time, right? there must be a reason. 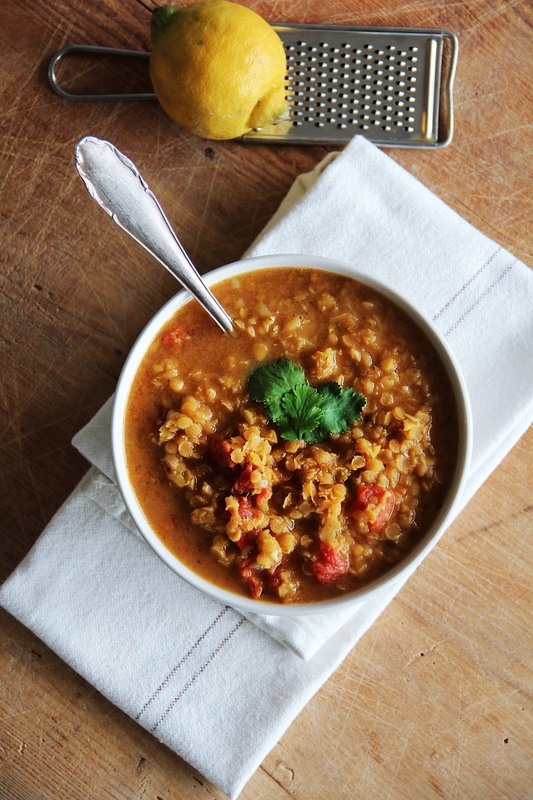 i find that lentil soups give me a lot of energy and the exotic flavors make me dream of a decadent summer vacay, yet again. oh, summer. the first glimpse of you was wonderful and i haven’t gotten enough, yet. i’m waiting for you. heat ghee in a large pot. sweat onions and garlic in it until translucent. add curry paste, cumin, cinnamon, ginger and chile and sweat a little more. add vegetable bouillon, tomato, coconut and lentils and let cook for 10 to 15 minutes on low, until the lentils are tender. season with salt and harissa. sprinkle with the lime juice and serve hot. I like your website very much, it is very simple but lovely. I’d like to ask you, if you could give the measurements of your recipes in gram?